In a pan, add diced mangoes, chilli powder, 1/2 tsp turmeric powder and salt along with 1 cup of water and cook till the mangoes become tender and well cooked. Grind grated coconut, cumin seeds, 1/2 tsp turmeric powder, green chillies and 1 sprig curry leaves with 1 cup yoghurt into a smooth paste. Add ground paste to the cooked mangoes and cook for few minutes in medium flame. Reduce the heat and add the remaining 1 cup yoghurt and mix well and cook for 1-2 minutes. Don't allow to boil. Heat oil in a pan, splutter mustard seeds.Add fenugreek seeds, curry leaves and dry red chillies and pour this over the pulissery... Serve with rice..
Love this tangy curry!! Yummy! Delicious pulissery, very inviting Shabna. wow.. looks delicious.. very new to me..
very delicious n finger licking good!! 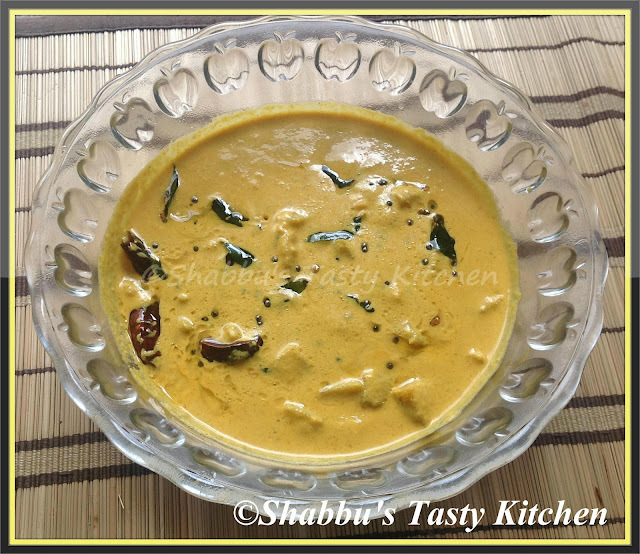 Thanks all for your comments..
Mambazha pulissery or mambazha kalan is one of the traditional recipe of kerala. You can not find any similar recipe in any other Indian cuisine.